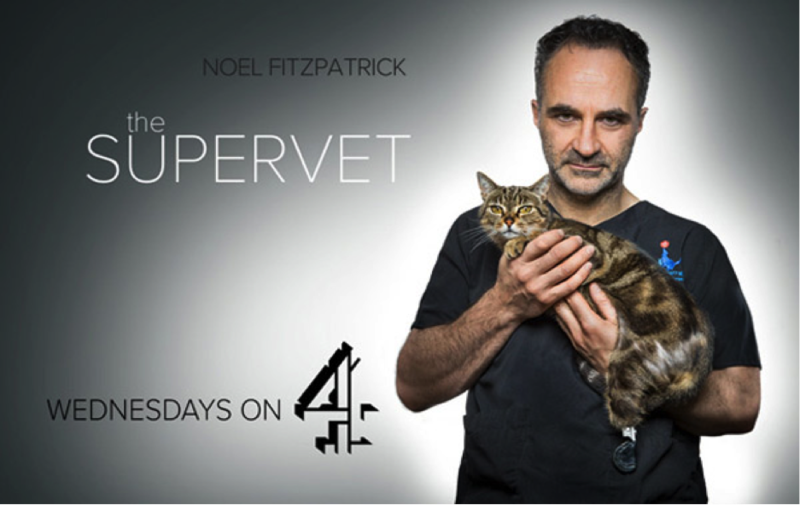 ‘The Supervet’ is a UK documentary TV series broadcast on Channel 4 showcasing the practice of orthopedic veterinary surgeon, Noël Fitzpatrick. It’s a sexed-up version of 1990s BBC TV prime-time favorite Animal Hospital, but focusing on advanced surgery and 21st century veterinary technoscience. Total hip replacements, limb-sparing procedures, graftings, prostheses and other ‘cutting edge’ surgeries provide a hospital docudrama with an animal turn. 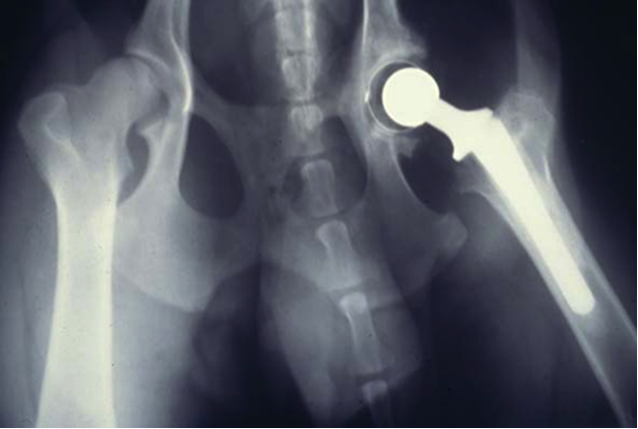 Total hip replacement is now relatively commonly carried out by specialist veterinary surgeons. Fitzpatrick is the pioneering hero-surgeon, making lame animals walk again. It’s an interesting phenomenon if you are concerned about the social construction of the animal patient – an entity conspicuously absent in current medical historiography. However, limb prostheses are not as cutting edge as they seem. In 1900, Frederick Hobday published the first edition of Surgical Diseases of the Dog (the words and Cat were added to later editions). 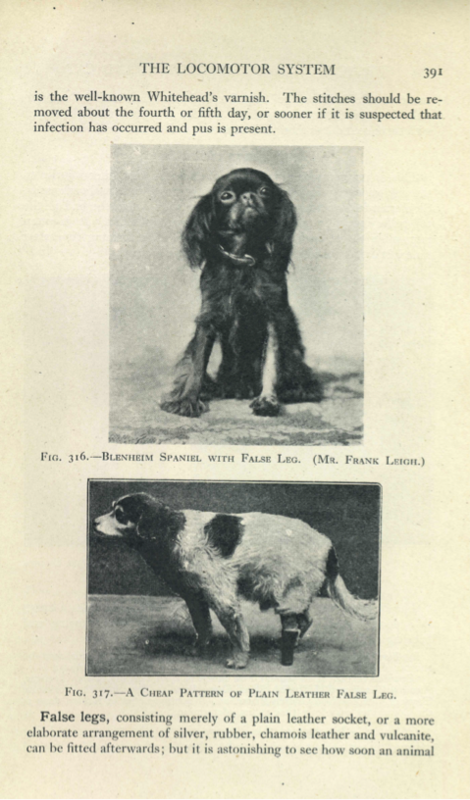 The book illustrates two canine amputees fitted with prostheses: one, a mixed-breed treated at the Poor People’s Outpatient Department of the Royal Veterinary College where Hobday regularly attended with students, was fitted with a functional wood-and-leather prop; the other patient, a Blenheim spaniel, probably treated at Hobday’s fashionable private practice in Kensington, London, sported a much more realistic prosthesis. Their juxtaposition in the book nicely illustrates the socioeconomics of public and private veterinary medicine, as well as changing ideas about animal surgery in the early decades of the twentieth century. This aspect of the development of companion animal veterinary surgery is essential to understanding how the veterinary profession negotiated its turn toward the small domestic animal in the second half of the century. The profession didn’t take the lead on dogs, it followed. The impetus towards advanced veterinary care was not increasing post-war wealth, but what happened in the inter-war period. These rather seismic changes took place out with the organised veterinary profession, in the animal equivalent of voluntary hospitals – Britain’s large network of poor clinics or charity animal hospitals, especially those operated by the People’s Dispensary for Sick Animals of the Poor. If that name sounds revolutionary, it’s because it was. I have explored this topic in detail elsewhere; the argument revises commonly held beliefs about the foundations of companion animal veterinary medicine. Page from Hobday’s Surgical Diseases of the Dog showing whole-limb prostheses in two dogs of different social class. The privately-treated Blenheim spaniel has a life-like prosthesis whereas the mix breed, treated at a charity clinic, has a functional wooden/leather prop. Frederick Hobday was a prominent teacher, surgeon and academic administrator, as well as an advocate for women in the veterinary profession. He qualified from the Royal Veterinary College, London, in 1892, stayed on there as a house surgeon, later becoming Professor of Materia Medica and Therapeutics. He was made Principal of the Royal Veterinary College in 1927 and remained there until 1936. He was knighted for services to veterinary education, and died in 1939. Though active in the small animal field, he is best remembered for the operation he refined for the treatment of ‘roaring’ in horses – an acquired paralysis of the vocal folds, resulting in a loud expiratory noise during exercise. He performed thousands of these procedures on working horses, who were, and still are, said to have been ‘Hobdayed’, although the operation was actually pioneered by Williams at Cornell University. Surgical Diseases of the Dog is a fascinating book, and false legs are not the only prostheses mentioned. To the discerning pet owner, artificial eyes provided a less alarming sight than an empty, enucleated socket, and spectacles could be tried if defective vision was caught at an early enough stage. Dental disease affected a great many companion animals, then as now, and Hobday collaborated with a London dentist to design dentures for dogs. A pair fitted to an aged Schipperke were deemed a success when a patient ‘tore the meat off a mutton chop very shortly after they had been put in’. Despite these successes, dog dentures never really took hold, although the idea was briefly revived for another veterinary species in the early 1980s. Sheep can suffer greatly from ‘broken mouths’ as they get older. An Edinburgh dentist, Adam Thomson, himself the son of a hill sheep farmer, had another stab at animal dentures in the form of a prosthetic splint. However, the difficulty and expense of custom-making prostheses to fit individual ovine mouths, and the welfare problems caused when such personal adjustment was not carefully undertaken, resulted in their general use eventually being declared unethical. Hobday’s book is important in the history of veterinary medicine because it marks a move towards academic and professional texts on companion animal surgery. More advanced surgery was possible because of developments in anesthesia, which Hobday also advocated. He promoted chloroform or, in smaller dogs and cats, its mixture with alcohol and ether (‘A.C.E’ mixture in the ratio 1:2:3). Hobday traveled the length of the country dispelling rumors that circulated about the dangers of chloroform in small patients. He used the case load at the Poor People’s Clinic of the Royal Veterinary College to demonstrate that, provided certain basic techniques were followed, large numbers of animals could be anesthetized safely, even by inexperienced students. He communicated his findings through the pages of the veterinary journals, as well as in his book – an early example of evidence-based veterinary medicine. Animal charity clinic in the late 1920s. None of the individuals pictured were members of the Royal College of Veterinary Surgeons. Their training had taken place within the PDSA. Professional closure on animal treatment was not achieved until the Veterinary Surgeons Act of 1948. Hobday also promoted asepsis in animal surgery. Vets at this time generally adopted a somewhat ‘informal’ approach to surgical asepsis, consistent with the relatively un-invasive procedures they were performing. 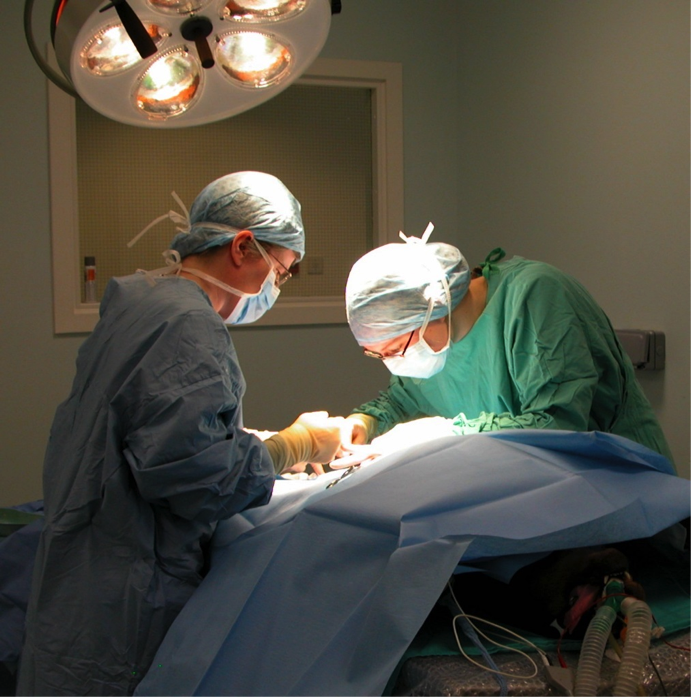 In the vast majority of general practices, canine and feline surgery would not have been performed in a dedicated operating room with field drapes, gowns, masks and the other hospital-style precautions that Hobday recommended. And in farm animals treated in the field, asepsis was virtually unheard of; analgesia was rudimentary or absent. A 1925 article in The Veterinary Record described the ‘castration’ of young female pigs by lay castrators (non-veterinary practitioners who traveled around farms for this purpose). The unfortunate animals were simply restrained by the foot whilst their ovaries were removed via an incision in the flank. No anesthesia or post-op pain relief, no surgical preparation or ‘scrubbing-up’. As might be expected, the operation had to be performed at some speed. Even today, animal ethicist Bernard Rollin, a long term faculty member at Colorado State Veterinary College, claims that there are no analgesics licensed and promoted for farm animal use in the United States, indicating a huge ethical gulf between the animals we love and those we love to eat. Hobday’s accounts in his dog book pointed towards a new paradigm of operative veterinary surgery. The book was well supplied with clinical case histories; the overall approach was modeled on human surgical texts of the time. His chapters included photographs and diagrams of procedures, surgical instruments and equipment, X-rays and pathological specimens. He was active in the Comparative Medicine section of the Royal Society of Medicine and regularly presented veterinary cases there. The inclusion of prostheses (limbs, eyes and teeth) in his book is very interesting. 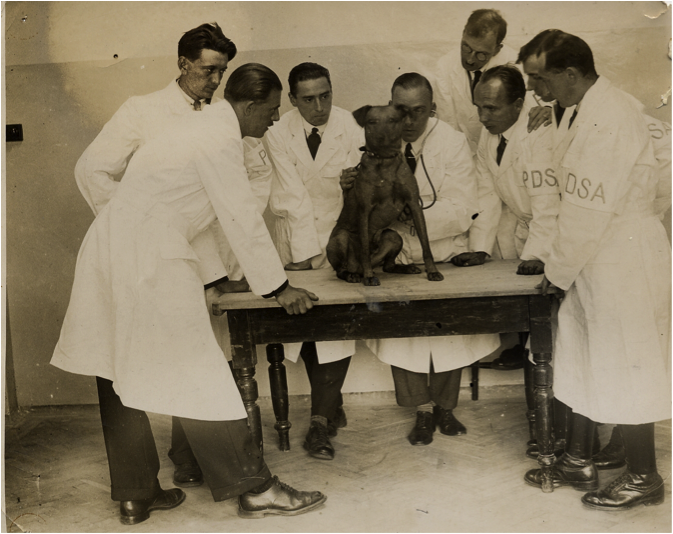 It illustrates the direct transfer of human surgical practice into the companion animal field – a recurring theme throughout the longer history of companion animal medicine and surgery. It was soon discovered, however, that dogs coped well without a limb. The fashion for false legs fell off, just like the prostheses themselves. It seems rather obvious now, but no-one realized that dogs did so well with three (or even two) legs until veterinarians started removing them, and they couldn’t start removing them until they could safely deliver an anesthetic that permitted such major surgery. animal model –> human patient. human patient <–> animal patient. animal model –> human patient –> animal patient. Animal patients are the final recipients. If there seems a slight irony in animal patients receiving the most thoroughly-tested modality, then that perhaps is some recompense for their on-going use as proxy humans. There are many examples of such cross-species exchanges, including insulin for diabetes mellitus, cardiac treatments and orthopedic procedures. The internal fixation of fractures, and the realization of the ASIF internal fixation system, is an area where surgical developments in humans and animals occurred almost in parallel, and is well described in Thomas Schlich’s excellent account, Surgery, Science and Industry. 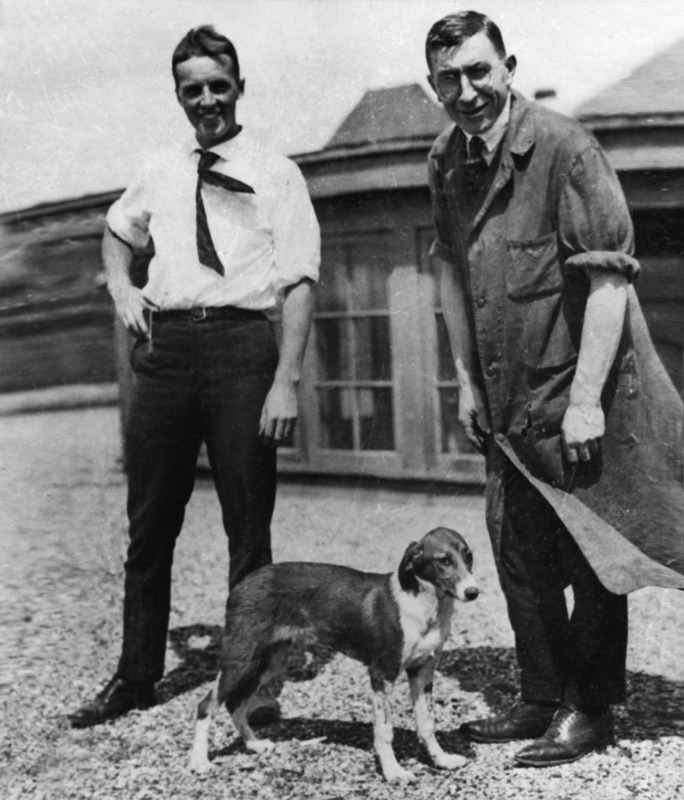 Frederick Banting (right) and Albert Best with Marjorie the dog (1921). She had been made diabetic by partial pancreatectomy and was then treated with an extract of bovine pancreas. The first human patient, 14-year-old Leonard Thomson, was treated shortly afterwards. Treatment of diabetes with insulin is now commonplace in dogs and cats, and of course, humans. New orthopedic procedures such as those carried out by ‘The Supervet’ may directly inform human treatment (so constituting an animal medicine à human medicine unidirectional model). Indeed this potential is explicitly made in an argument by Fitzpatrick and others that relates to the slippery concept of ‘One Medicine’ or ‘One Health’. But this, too, has an historical precedent: bovine fertility treatments arising from post-war livestock improvement efforts preceded and directly informed those developed for use in humans. Ethically, clinically-derived advances seem less problematic than the use of experimental animals per se, as there remains a pervading curative, ‘no harm’ intent throughout. Clinical cases may also be more transferable. They do, however, beg the question of when ‘pioneering’ treatment becomes experimental in the clinical veterinary context. This is an issue decided by the profession’s regulatory body, The Royal College of Veterinary Surgeons in Britain. There are no automatic givens and opinions change: for example, kidney transplantation in cats is currently considered unethical in the UK but is generally permitted by US regulators. Berger’s famous question can usefully be asked in relation to the history of medicine. Despite animals being everywhere in the history of medicine, they have only recently started to be featured in scholarship, and the question of how to write animal history and the history of animals’ own medicine poses some interesting challenges. How do we deal with the animal patient as a scholarly subject? Do they have agency? The patient figures in veterinary procedures. All practicing veterinarians know that animals exert agency that amounts to a kind of ‘consent’ with respect to their treatment. Protocols in veterinary practices, whatever the animal species, are constantly changed to adapt to what an individual animal will tolerate or accept. An orthopedic vet will, for example, consider a patient’s temperament and personality when considering whether to choose to repair a fracture using an external fixator, a bone plate or a cast. Great efforts are made to find a regime that will work for owner and animal in coping with diseases like insulin-dependent diabetes mellitus. If an animal won’t accept tablets, then an alternative form of treatment will be sought, such as liquid medication or long-acting injections. 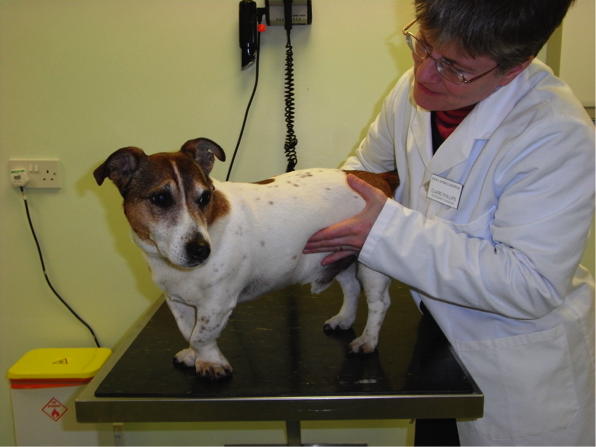 These are normal, everyday concerns in veterinary practice; the patient figures. But what does quality of life mean for an animal? Is length of life important? How might the costs and benefits of treatment (or non-treatment) be squared? The human-animal interaction in clinical veterinary medicine is a triad (animal-owner-veterinarian), rather like in pediatrics (child-parent-doctor), which can also feature a non-verbal other. The fact that in some US states animal ‘owners’ are now referred to as ‘guardians’ reflects a gradual move towards a new form of animal autonomy and agency that poses challenging questions for veterinary ethics. Will a paradigm shift in veterinary medical ethics develop which allows an animal patient to ‘choose’ in some practical and meaningful way? Sounds improbable? Similar ideas have been around for some time in animal welfare science, in the form of preference tests which try to determine what is really important to an animal with regard to his or her immediate surroundings. Competing preferences can be also be ‘titrated’ against one another to determine relative importance of different environmental variables, thus allowing some access to the animal’s subjective state. Could similar approaches be adapted with respect to animal treatment? A potential danger in veterinary medicine is that the owner gets treated as much as the animal. Anthropocentrism and anthropomorphism carry a risk of animal over-treatment, ushered in through the excitement of technomedicine or the prolongation of life by a few months. However, paradigm-shifting technical advances in animal surgery or cancer care are not necessarily wrong. Perhaps vets are too quick to reach for the euthanasia solution, or too content to leave animals in low-grade treatable suffering? Not so long ago analgesics like morphine were withheld from animals for what were generally understood to be ‘sound’ reasons, and the history of veterinary medicine shows that techniques and procedures seen to be peripheral or controversial may quite quickly be incorporated into ‘normal treatment’. In this sense, Hobday and The Supervet represent rather similar figures, both involved in testing and stretching boundaries of what veterinary surgery is and could be. A great deal of what was included in Hobday’s book is now considered standard, good surgical practice in veterinary medicine. However, lessons from human medicine also show that technomedicine carries a danger of excluding more fundamental patient-centered notions of care; indeed, the whole concept of care theory has arisen partly for these reasons. It is notable that in launching his latest project, a dedicated cancer hospital for companion animals, Fitzpatrick is careful to point out that the ‘human factor’ in care is just as important as all the technology and cutting-edge treatments. Paralleling these kinds of developments is a growth of interest in veterinary palliative care and the animal hospice movement. As a practicing vet myself, I believe a careful re-reading of veterinary history can help inform these debates in relation to the treatment of non-human others. And maybe human others too. Hobday, F. (1900): Surgical Diseases of the Dog. London: Baillière, Tindall & Cox. Gardiner, A. (2014) ‘The dangerous women of animal welfare: how British veterinary medicine went to the dogs’, Social History of Medicine 27 (3): 466-487. doi: 10.1093/shm/hkt101 (open access). 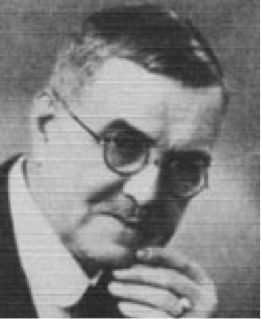 Hobday, F. (1938): Fifty Years a Veterinary Surgeon. London: Hutchinson & Co. Ltd.
 Hobday, Surgical Diseases, 6th edition, p.160. Kerr, W.W. (1925): ‘Castration of male and female pigs,’ Veterinary Record 5(2): 19-24. Bernard Rollin, Key Note lecture, Vethics for Vets Conference, University of Vienna, Faculty of Veterinary Medicine/Messerli Institute, 17-19th September 2015. Schlich, T. (2002) Surgery, Science and Industry. A Revolution in Fracture Care, 1950s-1990s. Basingstoke: Palgrave Macmillan. Fitzpatrick, N. (2011) ‘Encouraging collaboration for the benefit of all’, Veterinary Record September 10, 2011, pp. 287-299, doi: 10.1136/vr.d5015. Wilmot, S. (2007) ‘Between the farm and the clinic: agriculture and reproductive technology in the 20th century,’ Studies in History and Philosophy of Biological and Biomedical Sciences 38(2): 316-339. Berger, J. (2009) Why Look At Animals? London: Penguin. Robert G. W. Kirk and Michael Worboys (2011) Medicine and Species: One Medicine, One History? The Oxford Handbook of the History of Medicine. (pp. 561-577). Oxford: Oxford University Press. See Weil, K. (2012) Thinking Animals: Why Animal Studies Now? New York: Columbia University Press, ch. 3, pp. 53-62. Fraser, D. (2008) Understanding Animal Welfare. The Science in its Cultural Context. Chichester: Wiley, ch. 10, pp. 191-216. Kernot, H. (2015) ‘Oncology hospital hopes to make its mark on history,’ Veterinary Times 45(36): 4. Cooney, K. (2015) ‘Offering hospice care for pets,’ Veterinary Record 177(11): i-ii. doi: 10.1136/vr.h4921.